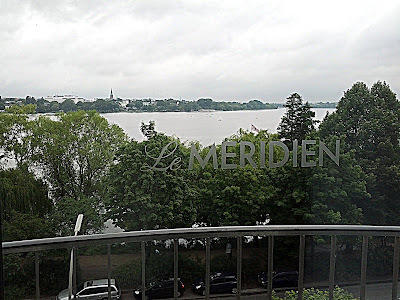 The first leg of my trip was in Hamburg, and I stayed at the Royal Meridien Hamburg. As the only Starwood hotel in town, it was a pretty easy decision to make - and the great rate I was able to get certainly didn't hurt! I checked in, and received a slight upgrade to a lake view room due to my Platinum status with Starwood. Unfortunately, the dreary weather didn't allow me to take in the full effect - but it was still a pretty nice view! 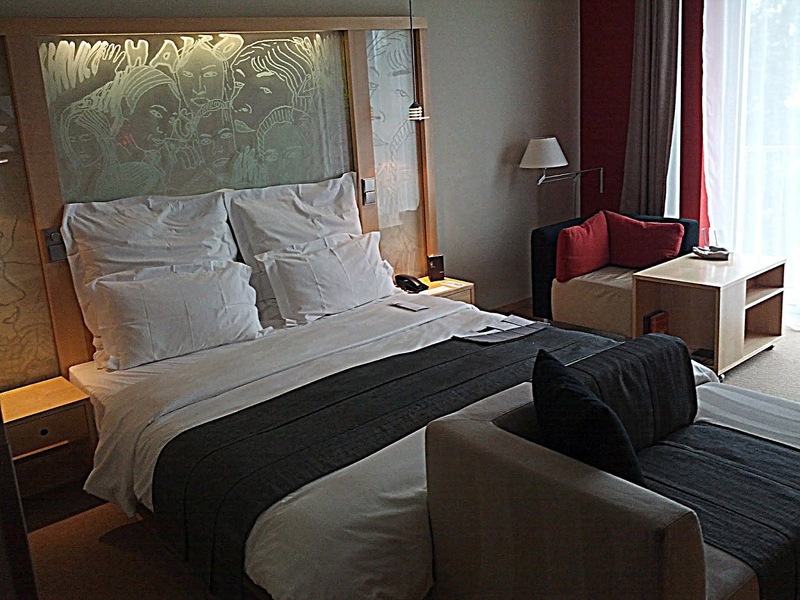 The room itself was pretty nice, and had some unique design elements that I thought provided a nice touch. Spotted in the wild: A proper bed in a European hotel! 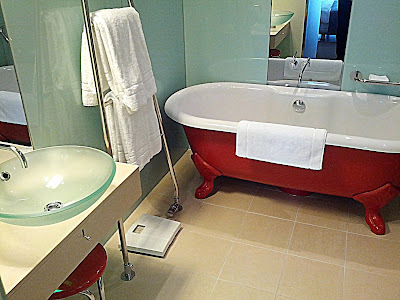 The bathroom was my favorite part - it had a really bold style, with some bright red finishes, and a huge shower as well. 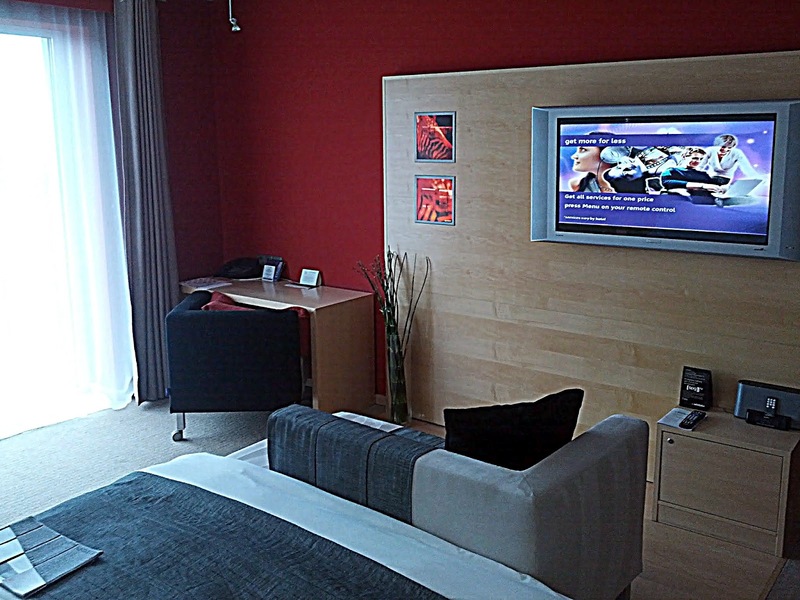 This being a business trip, I was only in Hamburg for 2 nights - and didn't have much time to explore the city. That, coupled with dreary weather, and a hotel that wasn't actually in the most exciting part of town, made for a largely uneventful visit. That said, I was able to sample some non-hotel food while out and about on the 2nd day. The driver we had taking us from place to place during the day recommended a place called Backbord in the St. Pauli quarter of Hamburg, so we stopped in there for lunch. The rain would not thwart us again! Several of my colleagues had a beet ravioli that sounded (and turned out to be) quite delicious. It was the vegetarian special of the day (they also have a daily vegan special and a meat special as well), but when I'm in Germany, it's all about the meat and potatoes. I ordered the meat special, which was a steak that came with fried potatoes and a side salad. The steak satisfied my carnivorous craving, but it was the potatoes that were the true star of the plate - I just love the way they do potatoes in Germany! 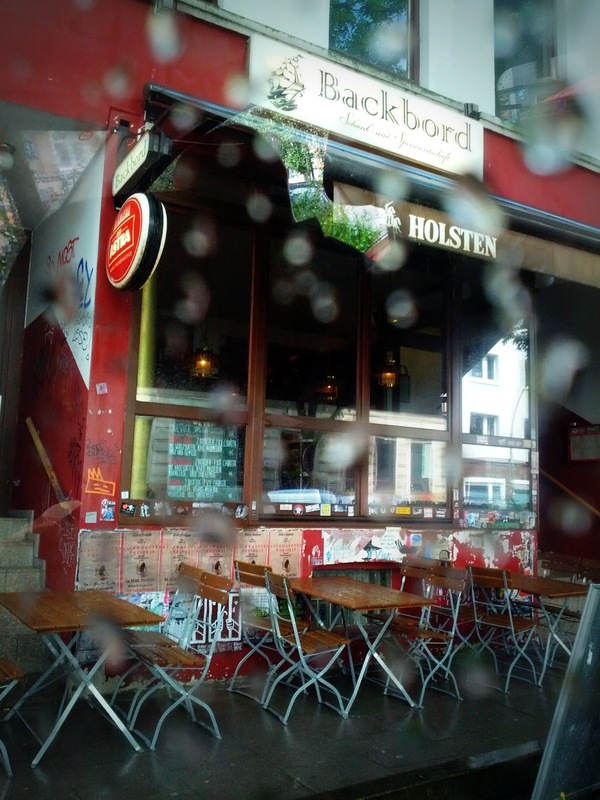 If you happen to find yourself in Hamburg, I would definitely recommend checking out Backbord. The food is good, and the atmosphere was very comfortable and casual. After wrapping things up in Hamburg, it was off to Munich. I stopped in at the Lufthansa Senator Lounge for some currywurst and a beer (thank you, Star Alliance Gold status), and then was off to my gate to start the next part of the trip.